One of the three mineral transporters that are the most active in providing support for bone decalcification. Has a pronounced anti-inflammatory effect. Only Calcium Orotate penetrates directly through the cell membrane, delivering calcium to the interior of the cell where it is readily utilized. Keeping your heart beating regularly. Helping the body metabolize iron. Since my research indicates that Calcium Orotate is one of the best absorbed Calciums, I chose it for that reason. Most calcium is of the cheap inorganic type and I asked myself the question: How could Carbonate or chalk be good for you. My second order gives you my answer. Dr. Hans Nieper's theoretical explanations of the mechanisms behind his stunning success in the clinical application of sophisticated mineral transporters rely heavily on the concept of the fixed pore mechanism of active transport. The theory called fixed pore mechanism suggests that a carrier molecule, in this case Orotic Acid (B-13), is attached to the compound being transported. This research has lead to the creation of mineral chelates called orotic acid chelates, or orotates which offers a 20 fold increase in utilizing minerals. Nieper promoted orotates as treatments for nearly every ailment imaginable and was consequently ignored; most of his medical claims were never rigorously tested. But in certain applications — such as athletic performance — where his ideas have recently received scientific scrutiny, they have been found to work. Nieper may have been on the right track after all. Orotates are mineral salts of orotic acid — used by plants and animals to make DNA and RNA. Hans Nieper, a physician and dabbler in offbeat theories of gravitation, used orotates clinically prior to 1980. He thought that orotate salts, being neutrally charged, pass easily through cell membranes. 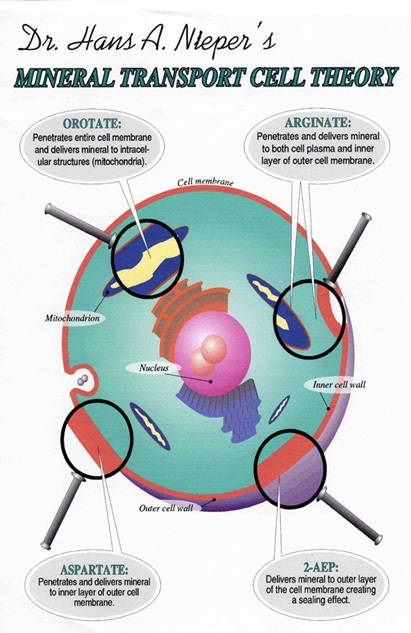 In effect, orotate ferries the mineral atoms into cells and tissues, producing higher concentrations. Calcium absorption takes place primarily in the small intestine, regardless of the source or type of the calcium. 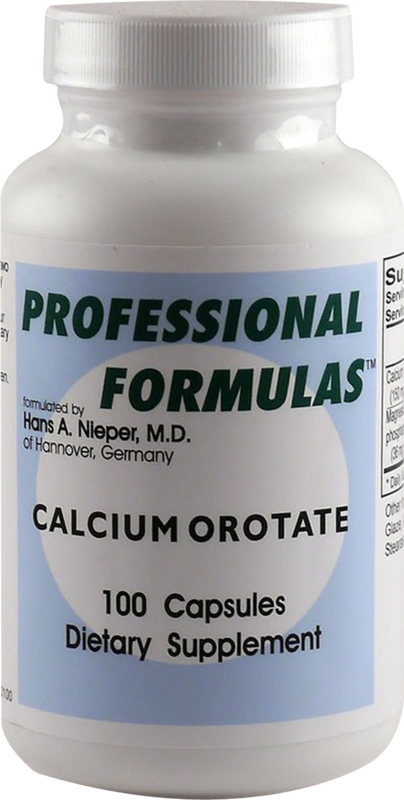 However, for the most effective absorption rate, the supplement must be formulated and packaged correctly (meaning that the calcium must be able to reach the small intestine intact...in order to accomplish this with a non-enteric coated capsule, many must be taken in order to get the same effect as one-two capsules of Dr. Nieper's specially formulated calcium orotate). Dr. Hans Nieper was actually involved in the development of both the aspartate and the orotate carriers in the late 1950’s. Clinically, he seemed to prefer calcium orotate and sometimes Calcium 2-AEP. Obviously, he was very aware of the aspartate form and chose the orotate carrier instead. One reason for this is that orotate carriers have no affinity for the outer cell membrane and are instead delivered in to inside of a cell before they ionize and become available. Calcium aspartate is instead targeted more specifically to the inner layer of the outer membrane. As far as the percentages, Calcium aspartate yields approximately 13% elemental calcium and Calcium orotate yields between 10-11%; the 1.5 grams will yield about 150-165 mgs of calcium. Given the 90-95% absorption rate with this form, compared to 5-10% of calcium carbonate for instance, the low elemental percentage is more than compensated for in the higher absorption percentage, which is about 5-10% for Calcium Carbonate. What Are The Advantages Of Mineral Transporters? How Are These Different From Other Mineral Supplements? Minerals are transported "in tact" into the cells without the concern of hydrochloric acid to break them down The transport molecule is then incorporated into biochemical processes, releasing the mineral at specific sites in the cell membrane and inside the cell itself at specific targets. Absorption is only one facet of bioutilization. Suplements that transport ionized minerals into the blood stream are less available at a cell level than mineral transporters, which are able to penetrate the cell membrane and enter the cell. Ionized minerals may or may not enter the cell and be available for use intracellularly. Why Use Mineral Transporters When They're More Expensive? Because pharmacological doses of nutrients can create imbalances in other nutrients (pharmacological doses are those that are higher than physiological norms). Instead, mineral transporters deliver minerals in physiological doses to tissues and cells, reducin the potentil of creating tissue damage and antagonism with other nutrients. Because of the poor utilization of other forms of minerals and the higher dosing required, these transporter mineral forms from Neiper are actually LESS expensive overall than other forms or delivery systems. Why Are Neiper Mineral Transporters Superior To Other Mineral Transporters? Dr.Neiper found that mineral transporters work better, when each granule is enterically coated by a micro-vortex process, which ensures intact passage of the compound through the acidic environment of the stomach. Other products who don't utilize this patented process end up providing "free" minerals and amino acids, which aren't targeted (tissue specific). Micro-vortex coating of mineral transporters is when individual granules are enterically coated with a soluable compound which resists the stomach acid and yet is readily dissolved in the alkaline environment of the small intestine. Micro-vortex enteric coating delivers the mineral transporter into the small intestine in tact where it is moved into the blood stream in tact, where the transporters enter the cells and the minerals are released at specific cell sites. I think a few of you have already heard of the concepts of active mineral transports in directed therapy. I will give you a tour of horizons of what active mineral transport is and what it can do and how it is to be explained. Late in the l950s it was discovered that cells of the female breasts becoming malignant are going to lose magnesium so we thought why not conceive of an extra-active transport principle to take magnesium into these cells with the help of phenylalanine and paraminobenzoic acid. At the same time, Hans Selye's book on the prevention of myocardial necrosis with the help of potassium and magnesium chloride was published and so we developed, in fulfilling the requirements of more active transport of potassium and magnesium into the cell, the potassium-magnesium aspartate in 1957-1958. This became quite successful world-wide as a medicament for the protection of myocardial necrosis, enhancement of liver functions and the detoxification of digitalis. Since this has been so successful, we followed this concept of active mineral transport and we changed as well the mineral which had to be transported as also the molecules which are suitable to transport the mineral into a cell by means of artificially created active transport. So the most important transporters we have today are aspartic acid, 2-aminoethylphosphoric acid and orotic acid. 2-aminoethylphosphoric acid (AEP) is a substance which plays a role as a component in the cell membrane and at the same time has the property to form a complex with minerals. You may replace the calcium by magnesium, potassium, iron or whatever. This substance goes into the outer layer of cell membrane is decomposed there, incorporated into the cell membrane and releases the ion upon metabolization. The second substance, the aspartates, especially the L-aspartate. goes to the inner layer of the outer cell membrane and there, upon metabolization releases the mineral to become the ion. The third substance which interests us enormously is orotic acid which forms a high complex salt with any mineral and which has no metabolic affinity to the outer cell membrane but penetrates the outer cell membrane even in the form of a complex salt and is only metabolized at the site of the membranes of the mitochondria and of the structures found in the cell plasma. Only here the mineral will be released to the form of an ion. So we have three different kinds of transporters: The AEPs (outer layer of the outer cell membrane), the aspartates (inner layer of the outer cell membrane) and the orotates (cell plasma organelles). Keep this in mind: different transporters go to different structures inside the cell. We will direct ourselves to calcium orotate. The orotic acid plays a very important role to so-called pentose pathway metabolism which accounts for the metabolism in cartilage tissue and especially for all organs which account for aging. There, the ribose coupling needs orotic add and therefore obviously the orotic carrying molecule has a high affinity to this kind of tissue, like cartilage which, so far, we were unable to influence and which experienced even more damage under the influence of cortisone. Therefore, calcium orotate seems to me to be one of the most important substances to prevent cortisone side effects in, eg, rheumatoid arthritis. This is very important. Used for symptoms of potassium deficiency. Used for symptoms of zinc deficiency. As an addition to the daily diet. Take two to three capsules with evening meal or as directed by your healthcare provider. If you are pregnant or nursing, consult your healthcare provider before using this or any dietary supplement. Orotate references included at end of article. 1. How does calcium orotate differ from other forms of calcium? It's estimated that just 9% of traditional calcium supplements are absorbed, meaning 91% is flushed away. Calcium orotate can penetrate into bones, cartilage, and other tissue more effectively than other forms of calcium to promote skeletal calcification. In general, adults and teenagers can take 800 to 1500 milligrams (mg) per day. Women who are pregnant and breast-feeding need more calcium, up to 1200 mg per day. Children ages 4 to 10 should take 800 mg per day. For calcium deficiency, servings vary according to individual need. 3. What's the best ratio of magnesium and calcium? Calcium and magnesium is a dynamic duo that helps bone health and the nervous system. Magnesium keeps too much calcium from entering the nerve cell, overloading the system and hyper-activating the nerve. Without magnesium, the nerves become over-activated, over-contracted and tense. While most combinations include a 2:1 calcium:magnesium ratio, 1:1 to 4:1 are also common. The goal is to promote good absorption and many researchers are now saying that a 1:2 ratio of calcium and magnesium orotate is best. 4. What are the advantages of mineral transporters? Mineral transporters have a much higher absorption rate (70-90%). Free minerals stay bound up and are for the most part unavailable to the cell membranes for use...they're too unspecific. These are Tissue Specific minerals. Mineral Transporters are attracted to and bio-utilized by specific tissues of the body, making therapeutic use more specific and effective. They act as "homing pigeons" for certain tissues. In today's terms, these are called "Targeted" minerals because they're delivered to specific tissues at specific cellular locations. 5. Why use mineral transporters when they are more expensive? Because pharmacological doses of nutrients can create imbalances in other nutrients (pharmacological doses are those that are higher than physiological norms). Instead, mineral transporters deliver minerals in physiological doses to tissues and cells, reducing the potential of creating tissue damage and antagonism with other nutrients. Because of the poor utilization of other forms of minerals and the higher dosing required, these transporter mineral forms from Nieper are actually LESS expensive overall than other forms or delivery systems. 6. Why are Nieper mineral transporters superior to other mineral transporters? Dr. Nieper found that mineral transporters work better, when each granule is enterically coated by a micro-vortex process, which ensures intact passage of the compound through the acidic environment of the stomach. Other products who don't utilize this patented process end up providing "free" minerals and amino acids, which aren't targeted (tissue specific). Micro-vortex coating of mineral transporters is when individual granules are enteric coated with a soluble compound which resists the stomach acid and yet is readily dissolved in the alkaline environment of the small intestine. Micro-vortex enteric coating delivers the mineral transporter into the small intestine intact where it is moved into the blood stream intact, where the transporters enter the cells and the minerals are released at specific cell sites.